Cher, composer Phillip Glass, country music star Reba McEntire and jazz legend Wayne Shorter will be honored for lifetime achievements in the arts at this year's Kennedy Center Honors. The national arts center also announced Wednesday a special award for the genre-bending musical "Hamilton," as part of the gala set for Dec. 2. Before last year's program, several honorees threatened a boycott if President Donald Trump attended. He and first lady Melania Trump decided to skip the event "to allow the honorees to celebrate without any political distraction," as the White House put it. The White House said it's too early to know whether Trump will participate in this year's ceremony. Trump may attend the Group of 20 summit in Argentina, which ends Dec. 1. Amanda Seyfried talks about the relationship between her dog and child, as well as how cool she thinks her "Mamma Mia!' co-star Cher is. Glass said he hopes Trump does show up as a conciliatory gesture to the arts community. "If he were to come, it would represent a real broadening of his perspective," Glass said. "American arts really is our biggest contribution to the world, far more than our politics." Last year, the Kennedy Center's president, Deborah F. Rutter, publicly thanked Trump for allowing the night to focus solely on the arts and the honorees. But she also said she hoped to see the president attend in the future. "I always hope that the person in that office makes a point of showing as much support for American arts and culture as his predecessors did and as his successors will," Rutter said in an interview. The "Hamilton" honor marks a first-time honor for a specific piece of art, and a first for a contemporary work. The award will go to the four main creators of the musical: writer and actor Lin-Manuel Miranda, director Thomas Kail, choreographer Andy Blankenbuehler and music director Alex Lacamoire. The musical is playing at the Kennedy Center through mid-September. 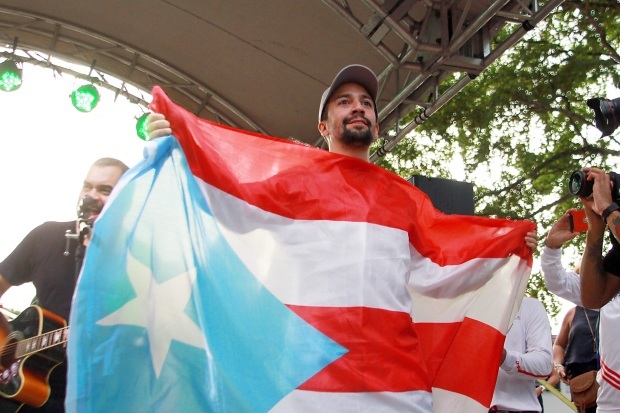 Lin-Manuel Miranda held auditions for his hit musical "Hamilton" in San Juan, Puerto Rico, on Wednesday, June 13. "This work has had such a huge impact in such a short time. It not only changed the way that people think about art, it changed the way they think about history and the storytelling of history," said Rutter, who didn't think awards like this would become regular events. "We felt it was important to honor it in real time and not 30 years in the future." The four men said in a statement that the honor was "humbling beyond our wildest expectations for our show." One of the special aspects of the Kennedy Center program is that each recipient is given a personalized introduction and performance by participants kept secret from the honoree. McEntire has served as one of those surprises for four past honorees: Dolly Parton, Loretta Lynn, Lily Tomlin and Carol Burnett. "When the curtain went up, I could see the surprise in their eyes," she said. "I can't wait to see who they come up with for me."